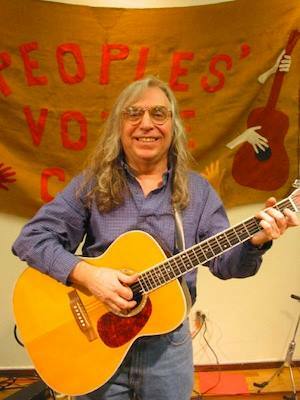 Ray Korona (1946-2014) was a guiding spirit of the Peoples' Voice Cafe since its early years. Ray's tireless dedication to the PVC; his generosity in sharing his time, skills, and talents; and the annual Ray Korona Band concerts celebrating our community cannot be replaced. His passing left a hole in the fabric of our lives that can be patched over but never mended. 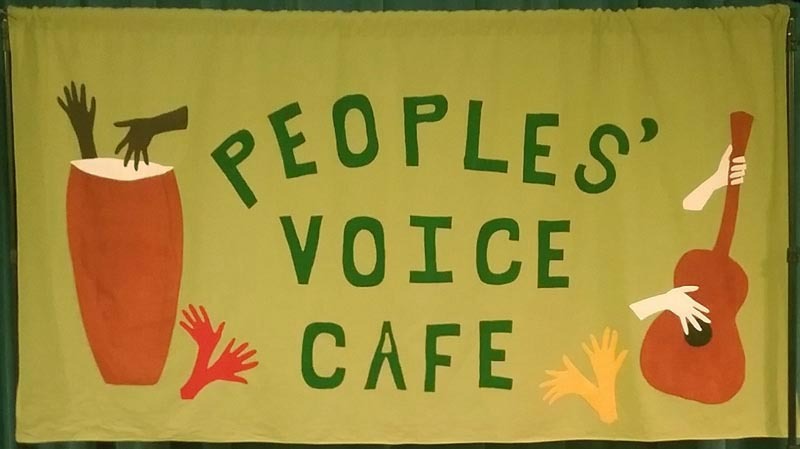 If you want to spend Saturday evening with friendly people who don't like budget cuts, wars, poverty, racism, sexism or homophobia, but do want a future in which people live in peace and justice on a healthy planet, the Peoples' Voice Cafe is the place for you. The Cafe is an alternative coffeehouse offering quality entertainment -- usually folk music and political music, but also poetry, storytelling, puppetry, dance and theater. Much of the music heard at the Cafe was inspired by the experiences of people fighting for survival and a better life. The performers represent many different cultures and political approaches. They express their concerns and hopes about a wide variety of humanitarian issues, but also sing about love and the lighter side of life -- typically with lots of audience participation. The Peoples' Voice Cafe has its roots in a time-honored tradition combining culture with political activity. Our Cafe was founded in 1979 by members of Songs of Freedom and Struggle (now a national organization known as the People's Music Network for Songs of Freedom and Struggle). Both PMN and our Cafe are dedicated to creating, supporting, promoting and performing progressive music and culture. The Cafe is a not-for-profit collective that is not affiliated with any political or religious organization. Other elements add to the performance to create the Peoples' Voice experience. We offer inexpensive, homemade refreshments. You can buy performer CDs as well as used books and records. Our literature table features an array of flyers announcing political and cultural events. Best of all are the people -- our audience and performers, our members and volunteers -- our community. Our banner was designed and created by founding member Judy Gorman in 1979. When the original burlap started falling apart, a new banner was created by Viktoriya Pinskaya, Moreen Ivice Rose, Jody Leight and Ruth Indeck.